You may think that “pinning” is only for Pinterest. Well, think again. 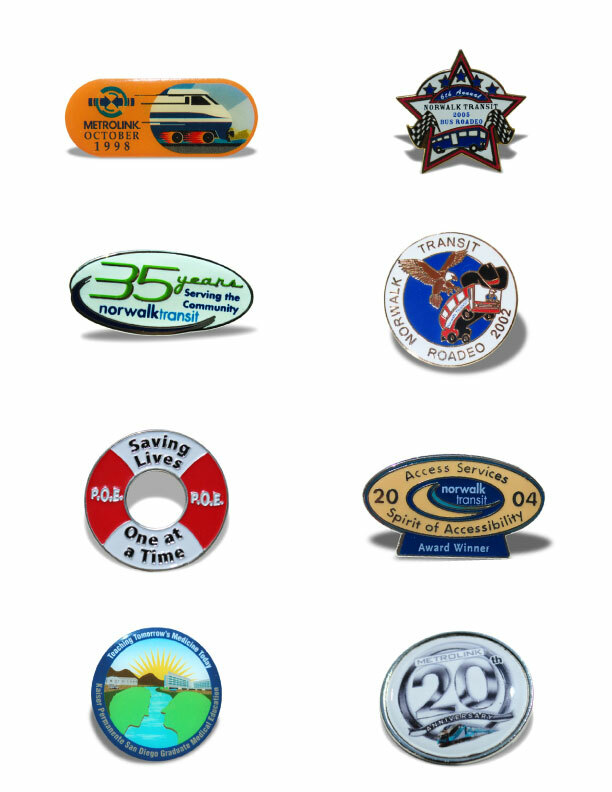 “Pins” make great promotional items or give-aways to honor anniversaries, celebrations, or facility openings. Pins can also be created to commemorate the start of a new program, to celebrate the opening rail or bus line or to recognize employees for years of service. Pins are also great morale boosters. People love pins. Pins come in all sizes and can be made from cloisonné hard enamel, die struck gold enamel, die struck soft enamel or etched metal pins. The most interesting pins have an unusual shape and graphical treatment. Indeed, some pins are very elegant and can be worn as jewelry. Pins can help kick-off a successful promotional campaign. Over the years, our clients have hired us to create some unusual pins which have are often distributed when invitees arrive at an event. These clients include Metrolink, Kaiser Permanente, Norwalk Transit and the Orange County Transportation Authority (OCTA), to name a few. Pins can have custom cut-out shapes. 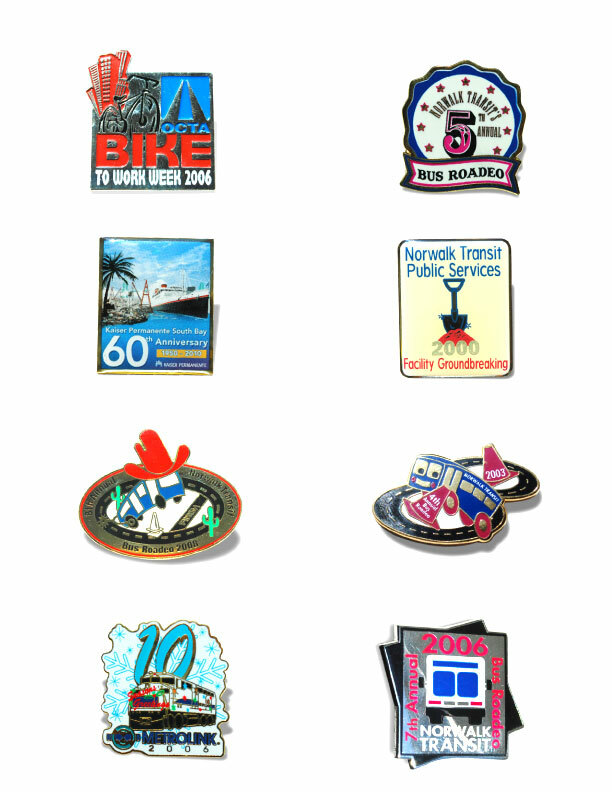 For example, several of the pins that we produced for the Norwalk Transit Bus Roadeo have shapes which follow the curvature of a whimsical illustration. In this post you will find samples of these pins. A pin emblem can also be used as a graphic marque for a newsletter. The art can be placed in a masthead or in a footer as a special commemorative emblem such as the 10th anniversary of the actual newsletter, or the 25th anniversary of a medical center. 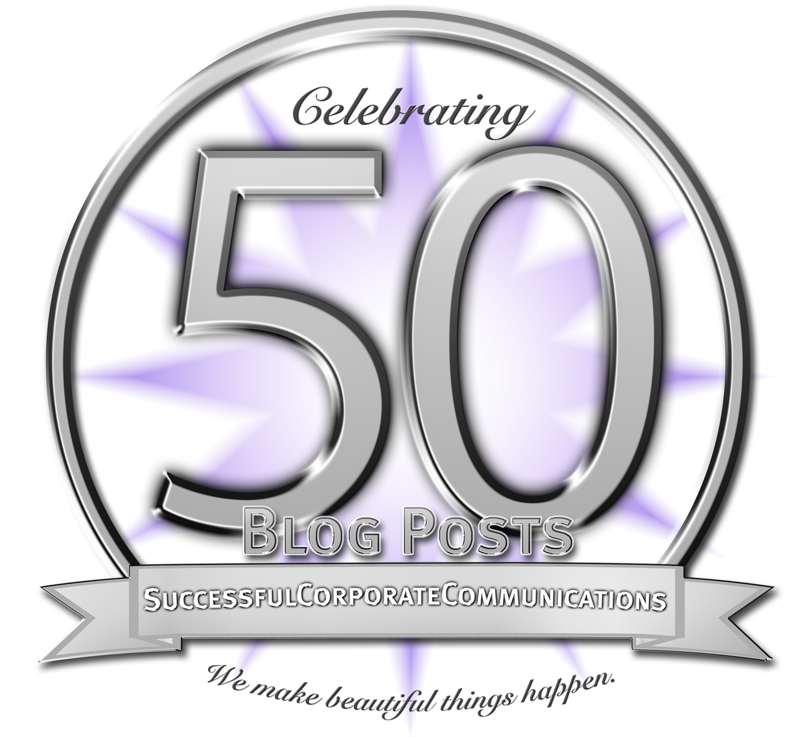 To find out more about how we can help create an interesting pin,promotional item or custom give-away item for your company’s anniversary or special event, contact HWDS at hwdesign@west.net. So next time you next a great promotion, try pinning it with a custom pin design. Pins make great event promotions—just don’t pop any balloons on the way.